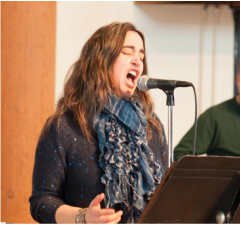 "When Sarah Jebian sings, you can’t help but be taken in by her magnificent sound. The colors in her voice are so rich and nuanced, and her heart pours through her music in a way that captivates you from the first note. Performing everything from classical to Broadway, Sarah has a profound control over her sound, making her one of the most versatile performers I’ve ever worked with. A true vocal treasure!" "Sarah makes me feel like the long trail of cigarette smoke in a jazz club when she sings lustful low notes, she lifts you out of your seat when she delivers her high notes and she can sell a song like Liza Minnelli - she has it all. Warmth, raw emotion, a soothing kiss and passion... that is Sarah Jebian.